OR, maybe he is offering ME a pink rose. Yeah... I like that... I don't normally get flowers. for our 4 1/2 year anniversary!!! Oh my gosh that is just too perfect...I love the way his head is tilted... What a great photo. Great pic, I'm glad you take orders from your assistant so well. I think he is perfect! Smiling face offering you a flower! Beautiful! 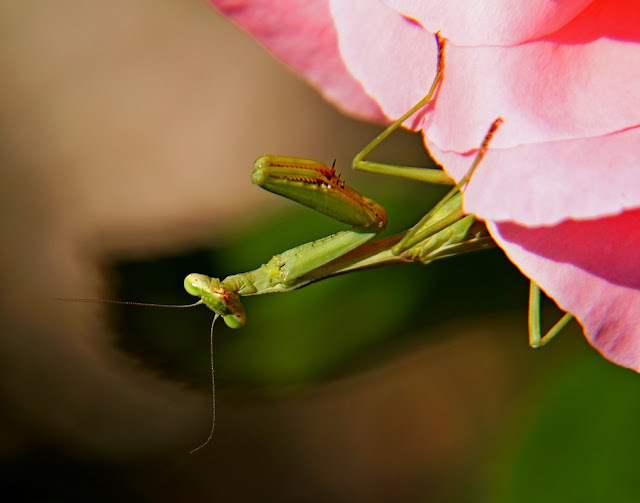 A fantastic capture of a preying mantis and nice of it to pose for you. a gret shot no matter what´s it´s gender. We don´t have it so it is fun to see. They are cool critters, great capture! Have a lovely weekend! Oh he's wonderful! and I think he was definitely offering you that rose! Smile you're on Candid Camera! What a great shot of the Mantis. Great shot of the Mantis. I think this is a she. They look like little aliens to me but I love to see them in my garden. What a great shot! They are such cool creatures. I did not see one all summer. I am so glad you didn't flip the image. It is a fun shot! He is posing for the jubilee snapshot. Great capture! I love the shot excatly the way it is. Beautiful flower that the little critter is enjoying.